You are here: Home › Cuisine › Europe › The ultimate Euro food trip! Inspired by this video, I’ve created my ideal Euro food trip itinerary which covers both regions. This itinerary includes all my favourite towns, restaurants, wineries and things to do and see. You could easily spend a week in each region following this itinerary but I suggest taking your time to get the best out of both Costa Brava and Emilia Romagna. Scroll down to view the itinerary. At the bottom of this post, you have the option to follow in my footsteps along this ultimate Euro food trip! Kick off your ultimate Euro food trip in Bologna, the capital of Emilia Romagna, Italy. 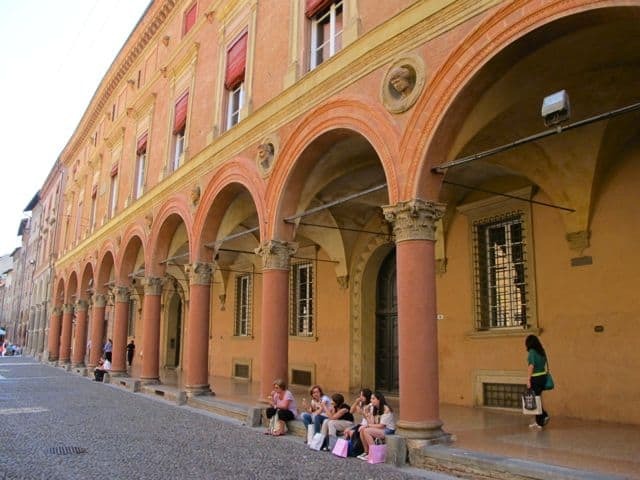 With its international airport and well-connected train station, Bologna is easily accessible from major Italian cities by high-speed rail and most European airport hubs like London, Paris, Amsterdam, Frankfurt and Barcelona. A panoramic view of Bologna. Bologna is one of my favourite cities in Europe. Its amazing food and historic architecture are major highlights but stroll around under its almost 40kms of porticoes (covered arcades), browse around its bustling markets, climb one of its historic towers or explore its diverse foodie scene and you’ll discover a gem of a city that’s worth returning to again and again. 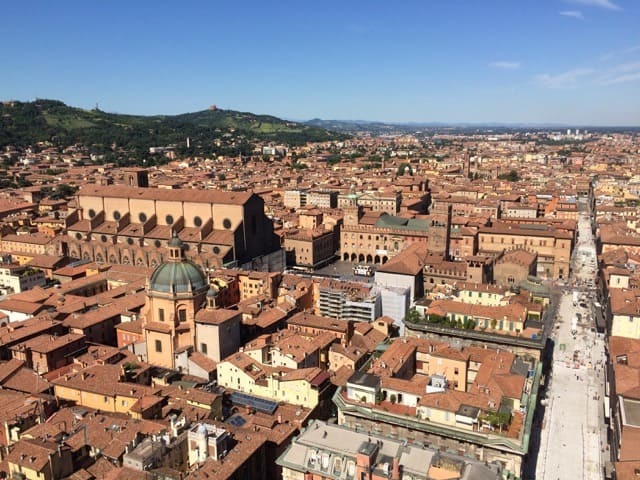 Read about other things to do in Bologna. One of my favourite deli’s in Bologna (in the Quadrilatero district). 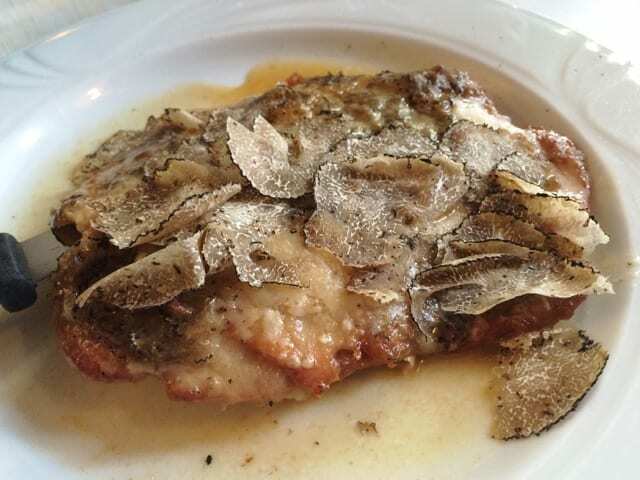 Veal and truffles at Ristoranti Da Cesari. And don’t miss the most divine treat: sgroppino – a mix of whisked sorbet, vodka, prosecco and lime zest. This one’s from Trattoria il Portico. Modena is perhaps most famous as the home of some of Italy’s most famous automotive brands such as Ferrari and Maserati – a tour of the Motor Valley is a must! 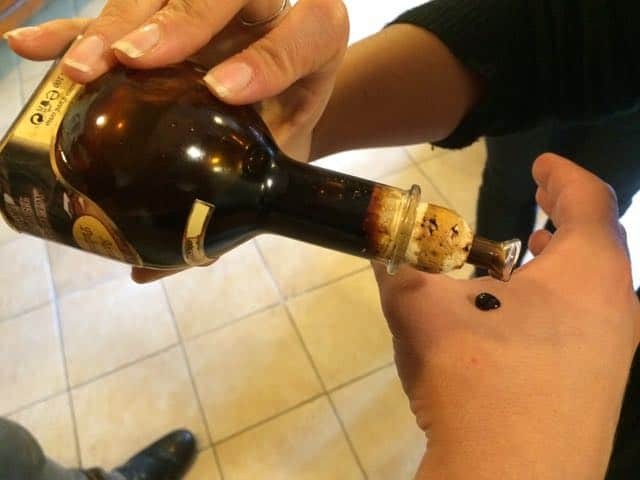 – but foodies will most likely associate Modena with balsamic vinegar or balsamico. 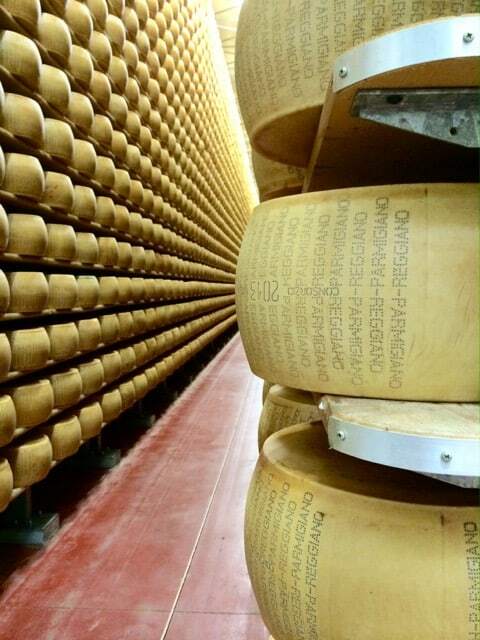 This is the perfect opportunity to visit the producers of some of Emilia Romagna’s most famous food products like Parmigiano Reggiano, balsamico and prosciutto di Modena (Modena ham). 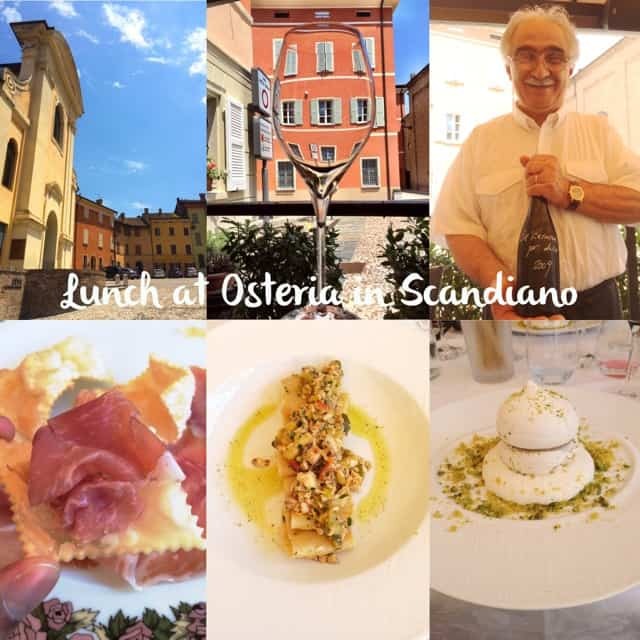 And it comes as no surprise that Modena is home to Osteria Francescana, a restaurant that consistently ranks as one of the top-3 in the world! If you can’t get in, check out Hosteria Giusti, L’Erba del Re, Ristorante Da Enzo or Osteria da Ermes. 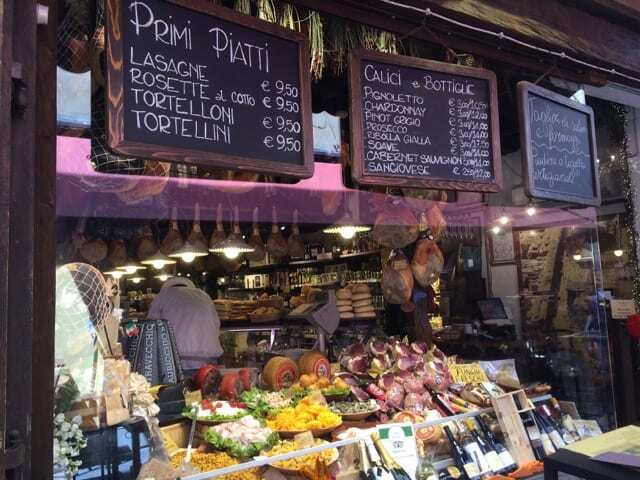 Read about my food tour around Modena. From Modena, continue to the town of Reggio Emilia. This little town is home to an amazing cultural treasure: the breathtaking Teatro Municipale (where Pavarotti made his stage debut). It’s a lovely town to stroll around but head to its outskirts and you’ll find Lambrusco country! Check out the Casali winery and have a meal at Osteria in the nearby village of Scandiano – read about my Reggio Emilia experience. 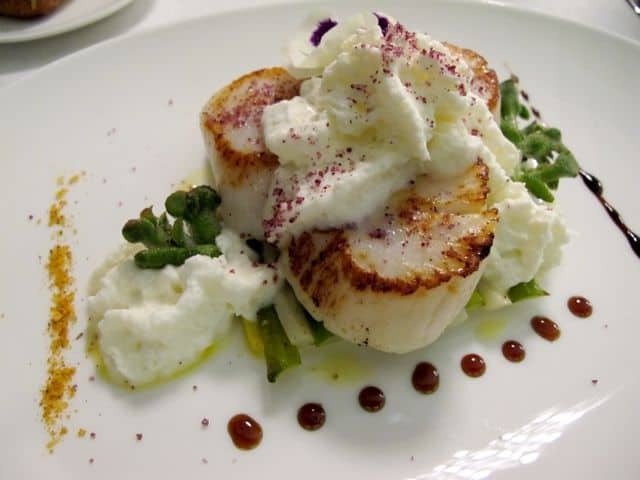 Enjoy a terrific meal at Osteria in Scandiano. From Reggio Emilia, you can continue to Parma (note: if you visit Parma, don’t miss Alfione at Viale Piacenza, a fabulous deli/restaurant) or back-track to Ferrara, a historic town with an imposing castle. Stroll around this picturesque town, visit the 14th century Castello Estense, the stunning Cathedral and the Palazzo dei Diamanti (Palace of Diamonds). Read about my visit to Ferrara. 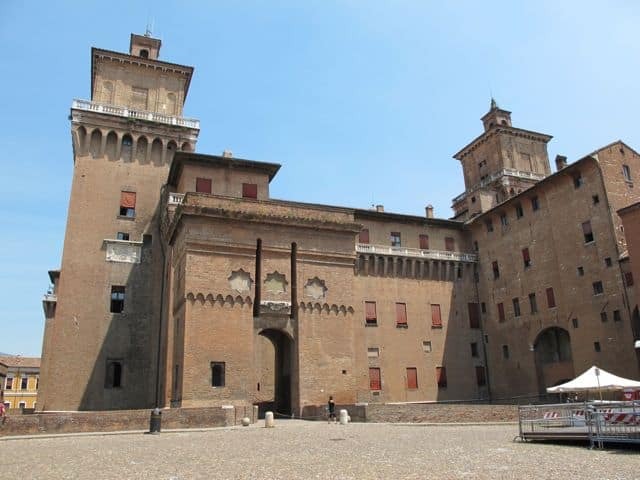 The formidable Estense Castle in Ferrara. 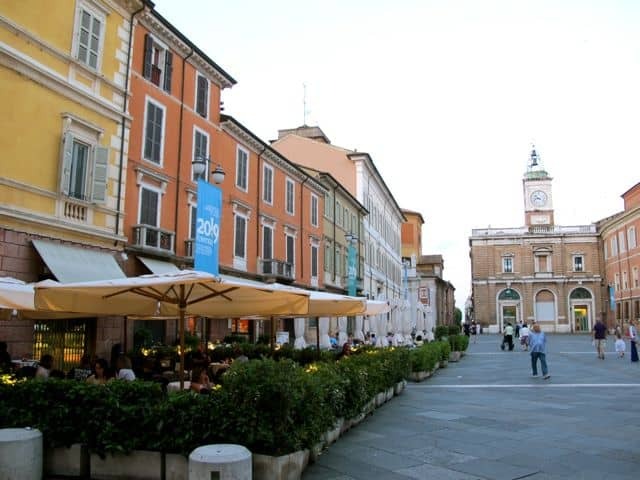 Head towards the Adriatic coast and stop at one of my favourite towns in Emilia Romagna: Ravenna. This ancient town is home to no less than eight UNESCO World Heritage sites! The main attractions are its churches, mausoleums and basilicas with their breathtaking mosaics but soak up the atmosphere by simply strolling around this gorgeous town. I recommend spending at least a night here to truly appreciate the town’s historic sights and wonderful atmosphere. 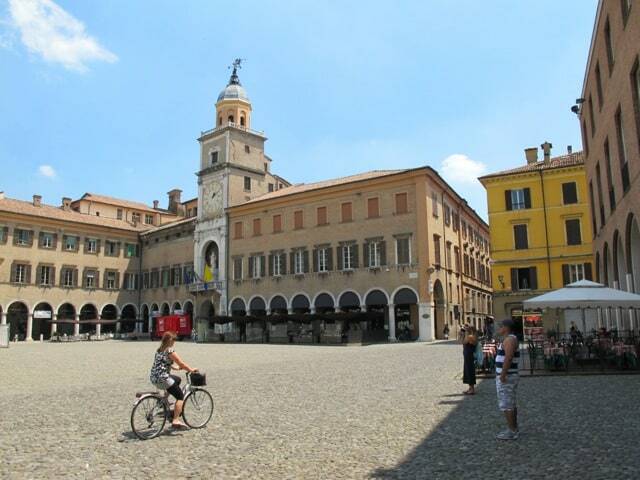 Read about things to do in Ravenna. Basilica di San Vitale, one of eight UNESCO World Heritage sites in Ravenna. From Ravenna, continue down the Adriatic coast to another historic town: Cesenatico. This ancient port town has canals which were designed by Leonardo da Vinci! 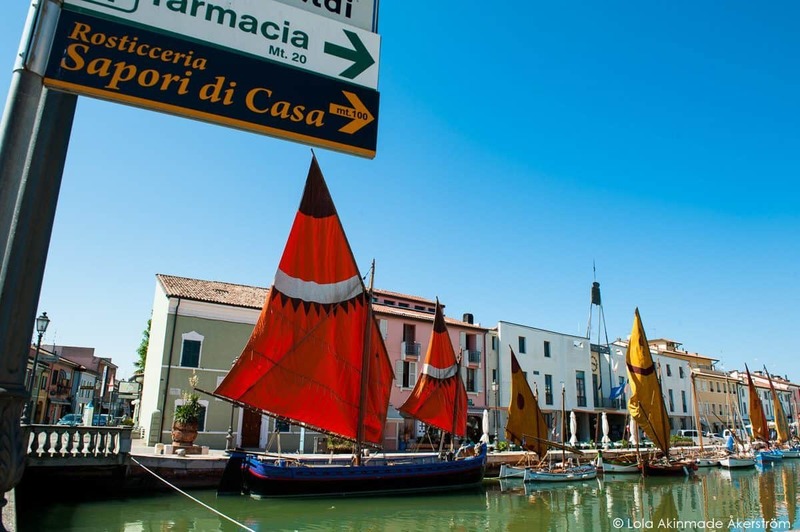 Cesenatico is home to a fascinating Maritime Museum as well as colourful sailboats in the harbour. A popular seaside town on the Emilia Romagna coast, Rimini has a plethora of hotels, restaurants and a broad beach that seems to go on forever! You can choose to have some beach time here or head for the nearby hills where you’ll find the oldest republic and one of the smallest countries in the world! If you opt for some beach time in Rimini, drop by the Habana beach restaurant. 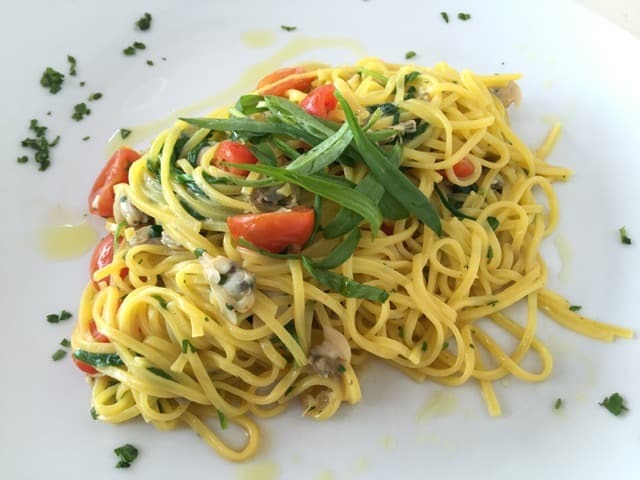 Nothing better than a fettucine vongole at the beach with a crisp Pinot Grigio or Friulano, and a gentle sea breeze to go with it! This tiny country is one of the smallest in the world! Located less than an hour’s drive from Rimini, most visitors come here for a day trip but I recommend spending a night or two here to experience its quiet, medieval streets when all the day-trippers have left. Have your passport ready to collect a special stamp! 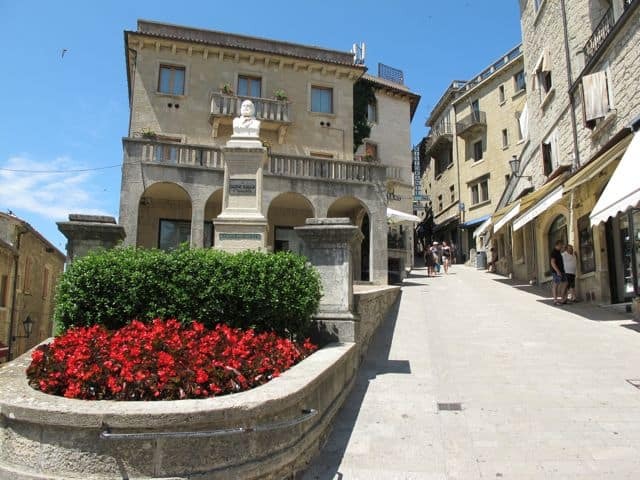 C. del Collegio street in San Marino. 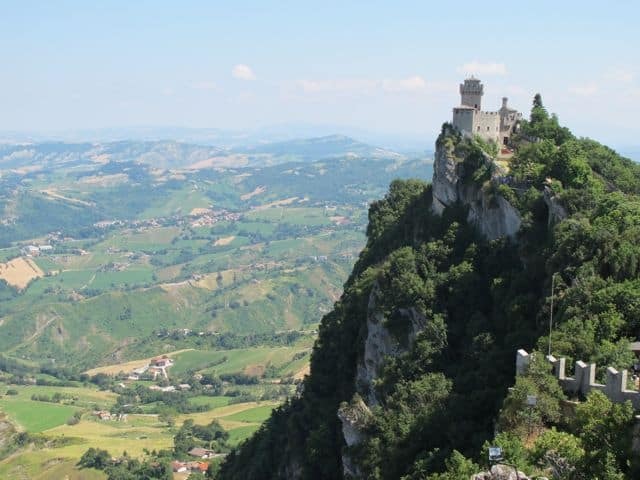 From San Marino, make your way back to Bologna along the Via Emilia. 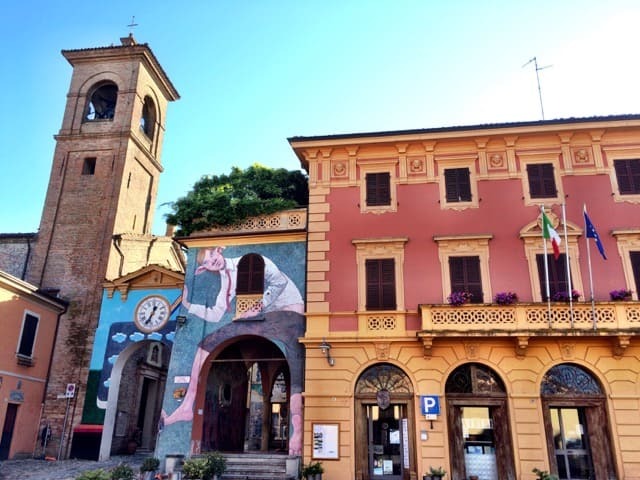 Make sure to stop at the gorgeous medieval village of Brisighella and, closer to Bologna, the village of Dozza, famous for its beautiful murals and its annual wine festival – Dozza’s castle (Rocca Sforzesca) is home to the regional wine store (enoteca) of the Emilia Romagna region. 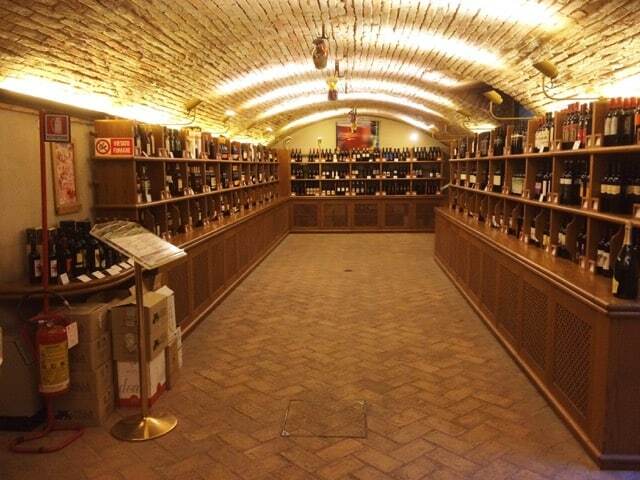 The Enoteca Regionale dell’Emilia Romagna is located in the celler of the Rocca Sforzesca. Ready to continue your Euro food trip in a different country? Hop on a flight from Bologna to Barcelona (about an hour). From there, drive to Girona (less than two hours) for Part II of the ultimate Euro food trip in Costa Brava! 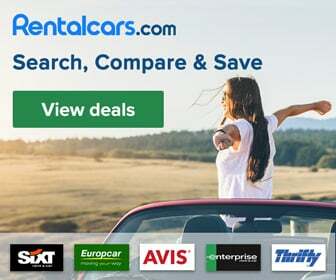 Costa Brava is a stunning coastal region in Catalonia just north of Barcelona and stretches right up to the border with France where the Pyrenees mountains meet the Mediterranean Sea. Costa Brava means ‘rugged coast’, a reference to the spectacular cliffs and hundreds of coves that line the coast. Though famed for its beaches and generous dollops of sunshine, Costa Brava is not only about sun, sea and sand. The region is a treasure trove of historic, cultural and gastronomic gems! Girona is less than a two-hour drive from Barcelona. Often overlooked by tourists, Girona is a gorgeous city located smack in the middle of the confluence of four rivers. As a consequence of its strategic location, Girona was occupied at different times in its history by the Romans, Visigoths, Moors and the French. Its medieval core is still intact, as are large parts of its medieval city walls. Fans of the Games of Thrones series shouldn’t miss Girona! Read about things to see in Girona. In the city centre, grab a meal at Le Bistrot, a popular restaurant that serves traditional Catalan fare. In addition, scenes from the Games of Thrones were filmed at the steps right outside the restaurant. If you’re looking for a unique gastronomic experience, try the special food and gin-and-tonic pairing at Hotel Carlemany! Just outside Girona, you’ll find one of the world’s best restaurants: El Celler de Can Roca! A meal here is a truly extraordinary (not to mention unforgettable) experience! 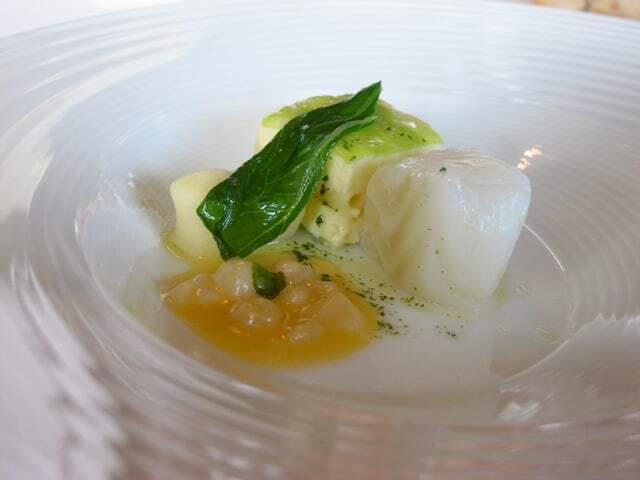 Read about my meal at El Celler de Can Roca. 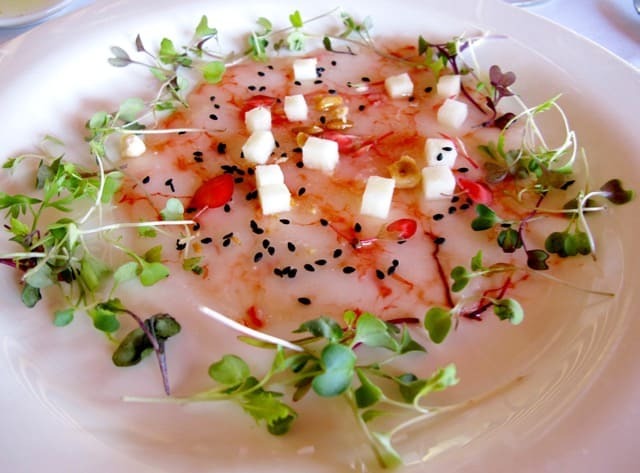 A meal at El Celler de Can Roca is an incredible foodie experience! From Girona, head towards the coast. 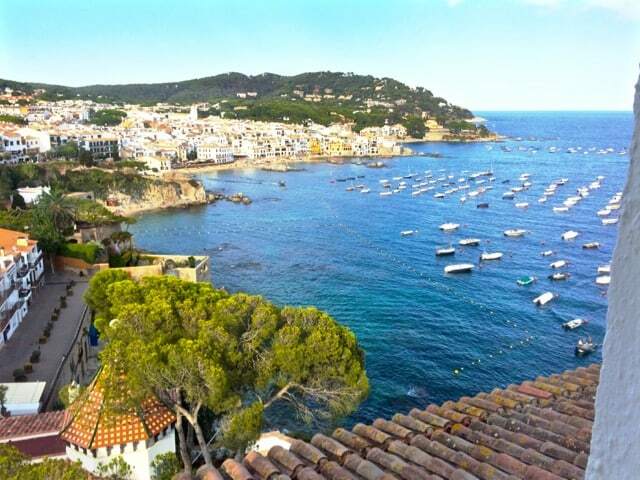 One of the most beautiful parts of the Costa Brava coast stretches from Calella de Palafrugell and Llafranc, past Tamariu, to Begur. This part of the coast consists of beautiful beaches, rocky inlets, pine-covered cliffs and gorgeous towns and villages. 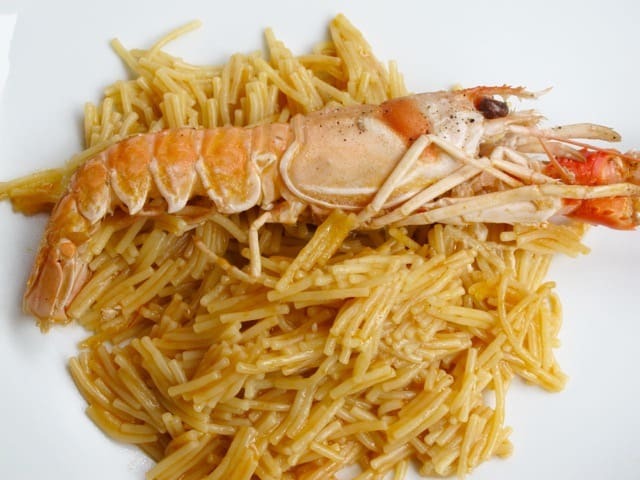 At the coast, order a delicious plate of Catalan fideuà, a paella with noodles. There’s a multitude of charming hotels and excellent restaurants along the coast. My favourite hotels in this area, which also have outstanding restaurants, are Sant Roc (Calella de Palafrugell), Casamar (Llafranc), El Far (Llafranc) and Aigua Blava (near Begur). 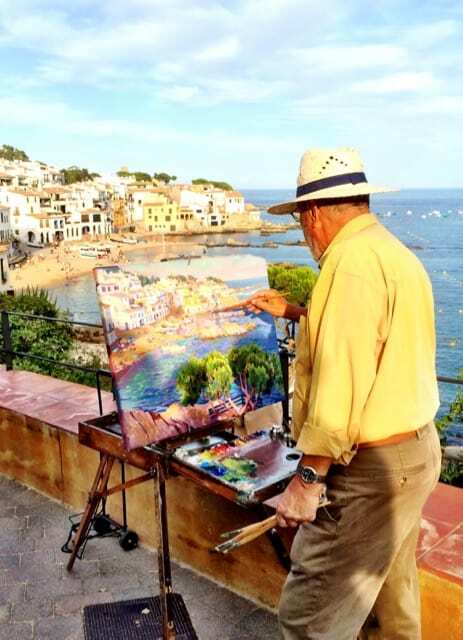 An artist painting the scenery of Calella de Palafrugell. 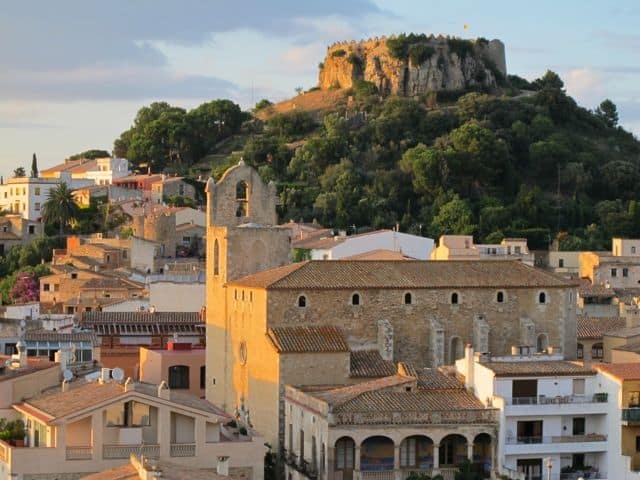 Begur is a colourful hillside town overlooked by a beautifully restored 16th century castle. There’s a lovely square, packed with terraces, and cobblestone alleys with a good choice of restaurants and cafés, some tucked away in beautiful courtyards. Another dish not to be missed: jamón! My favourite is the Iberico ham but the Serrano is just as good! 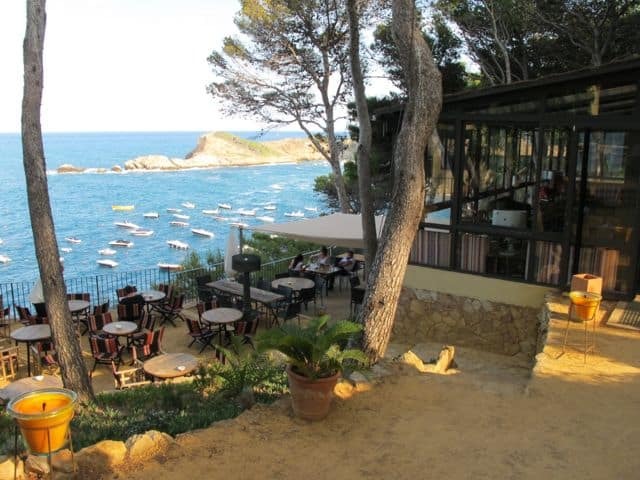 From Begur, take the road to Sa Tuna, a hamlet on the coast with a small beach. The road winds through quiet neighbourhoods and thick forests, and offers beautiful vistas of the rugged coast. A great place to stop for a drink and a meal is the Vintage Lounge – or you can stay at the adjacent Vintage Hotel. Located under a canopy of pine trees on a cliff-edge, Vintage Lounge is a great place to simply chill and watch the waves crash on the rocks below. 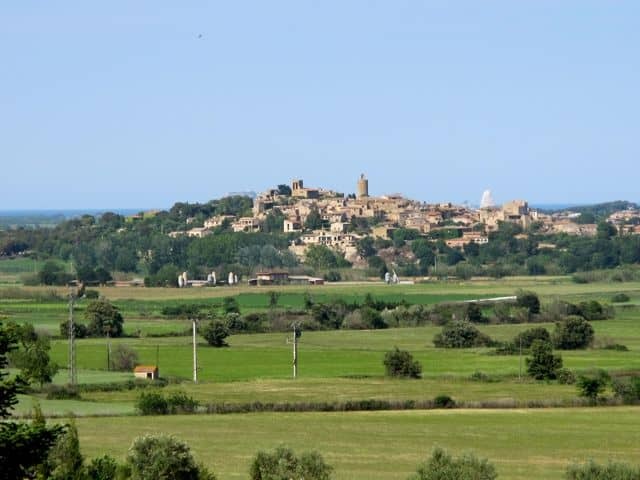 Close to the coast, you’ll find the agricultural Baix Empordá region. Peratallada is a fortified medieval town in this region. The town, with its 11th century castle (now home to a luxury hotel), 13th century Romanesque church, gorgeous cobblestone streets and picturesque squares, is a popular place for day-trippers who come here to soak up the medieval atmosphere but stick around in the evenings for a romantic dinner at one of the numerous restaurants. For a dose of indulgence, I can highly recommend the Mas de Torrent Hotel and Spa, one of Costa Brava’s most luxurious hotels, which is situated a short drive away from Peratallada. The hotel also has an excellent restaurant! Read about my stay at Mas de Torrent. A superb prawn carpaccio at Mas de Torrent. 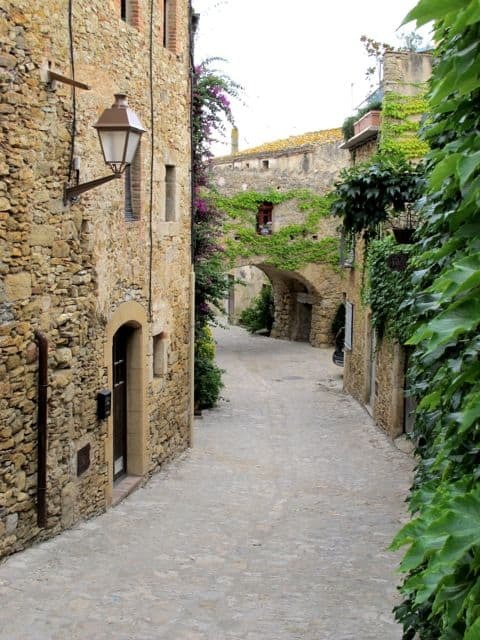 Pals is one of the most impressive medieval towns in Costa Brava. Situated in the Baix Empordá region, a short distance from Begur, Pals’ main attraction is its beautifully restored medieval quarter. Pals is also home to Vicus, one of my favourite restaurants in this region. 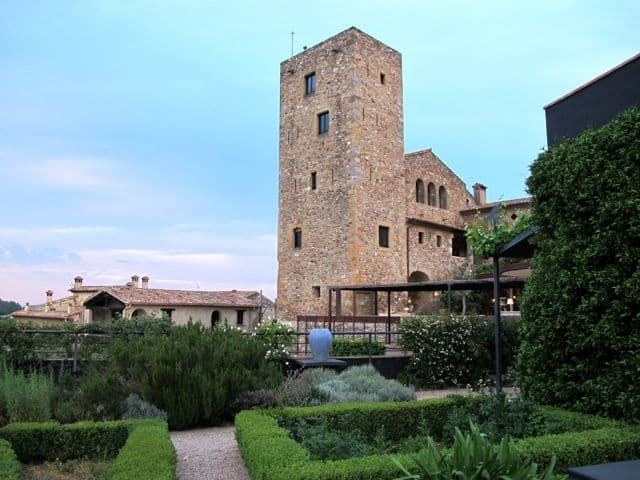 If you fancy staying in a castle, look up Castell d’Empordà, a beautifully-restored castle that overlooks the Empordá plains. Its restaurant, Drac, is another terrific dining option I can highly recommend! The Castell d’Empordá hotel and restaurant. From the Baix de Empordá, head north past the vast Bay of Roses to the Cap de Creus peninsula, a rocky, mountainous region of wind-swept slopes covered by thick gorse; quaint coastal villages; and crystal-clear coves. Read more about Cap de Creus. 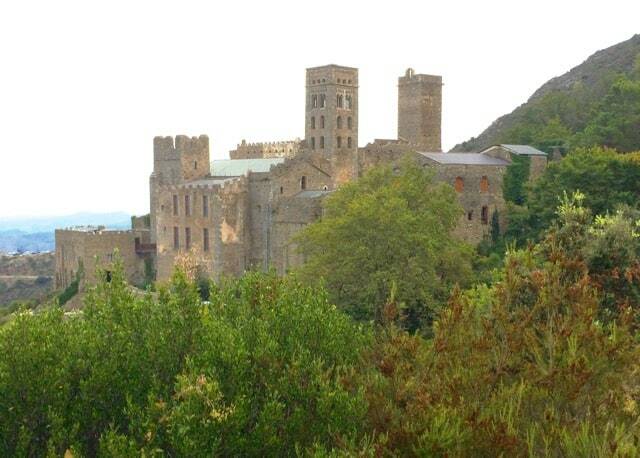 The Sant Pere de Rodes abbey is one of the main attractions in Cap de Creus. The charming fishing village of Cadaqués, with its whitewashed houses and gorgeous harbour, is famed as being a favourite haunt for artists and writers, and is absolutely worth a visit. Continue further to Port Lligat to visit Casa Dalí, the former residence of the great artist Salvador Dalí – this is a wondrous experience you wouldn’t want to miss. In Cadaqués, drop by at Can Rafa for a great meal. The restaurant is owned by the Martín Faíxo family who also own Mas Perafita, a gorgeous winery/B&B in the hills of Cap de Creus. 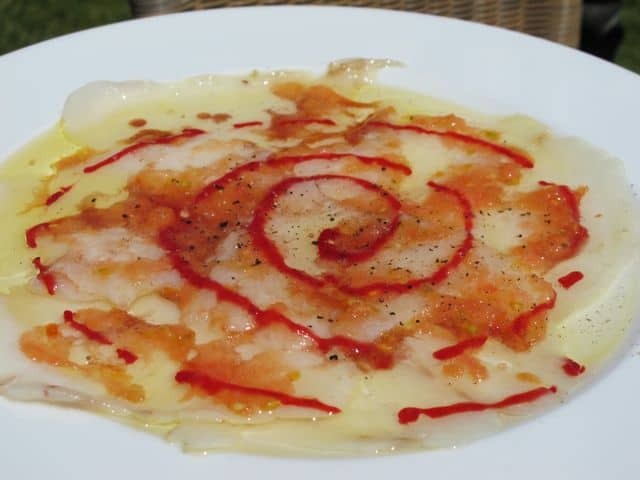 The delicious bacalao carpaccio at Can Rafa. Relax in the hammock at Mas Perafita. From Cap de Creus, head inland towards the hilly Garrotxa region. On your way, make sure you stop in Figueres, home of the world-famous Dalí Theatre Museum. You can also opt to have lunch in Figueres. Restaurants I can recommend include Restaurante Duran (a classic in Figueres frequented by Dalí himself) and El Lloc Cafe Bistrot. The Dalí Theatre Museum in Figueres. 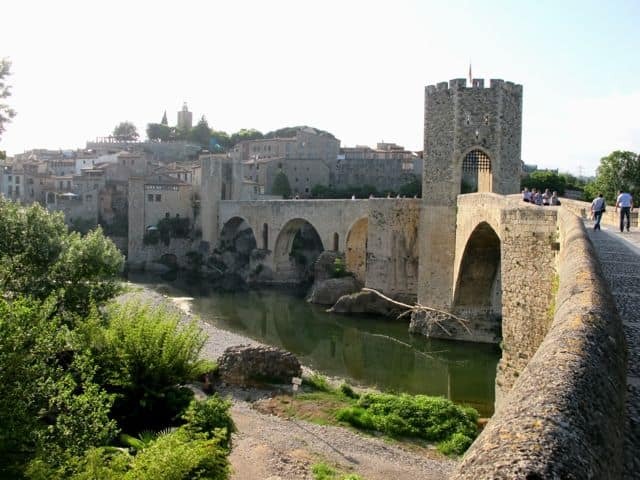 Make Besalú, a stunning medieval town, your first stop in the Garrotxa region! The first thing that will grab your attention as you approach the town is the magnificent 12th century Romanesque bridge over the Fluviá river. The bridge leads visitors into the town, with its arcaded streets, cobblestone alleys and squares. 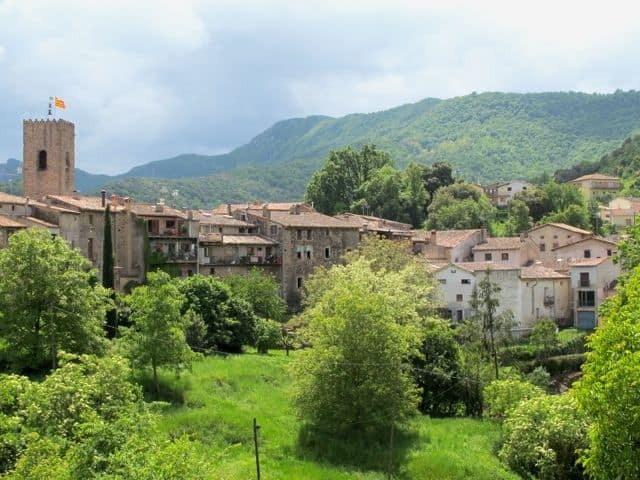 Santa Pau is another medieval village in the Garrotxa region that I absolutely love. Located near the Garrotxa Volcanoes, Santa Pau is tiny but boasts gorgeous porticoes, alleys and arcades as well as a 15th century Gothic church. Moreover, this wonderfully atmospheric village is home to another of my favourite restaurants in Costa Brava: Cal Sastre. Gorgeous cannelloni at Cal Sastre in Santa Pau. Read more about Emilia Romagna and Costa Brava on Velvet Escape. Emilia Romagna is really where it is at. I spent a month in the region, and some of the best food (and wine for that matter) was staying with local italians. I will def. have to add costa brava to my list. Lots of delicious food and views … going to either of these places on my upcoming Euro trip will be a great decision on my part! I cant think of a better way to see Europe than by eating great food and drinking lots of wine! Thanks for your lovely comment! Keep Sant Roc and Aigua Blava in mind as well when in the area: great coastal location and excellent food! The Costa Brava area is one we really want to visit in Spain. We have friends who loved their time in Cadaques and Begur. When we go – and we will! – we’ll keep Mas Perafita and Mas de Torrent in mind as a base for exploring around :-).